Its sort of funny how things happen at times ... Over the summer while browsing the new fiction at the WT Library we noticed "Petropolis". After reading the Gary Shteyngart blurb on the back cover thought we'd give it a try. WE LOVED THE BOOK! In fact, we liked it so much we recommended it to all our friends and because the book was about a young Russian girl who makes her way to Brooklyn and takes the F train and even lives on Ocean Pkwy thought we'd recommend it on the blog. (Plus we borrowed it the WT Library). Things got away from us but it was still on our list of 'to do posts' when a few weeks ago we got an email from a local Kensington to include the link to her site for the blog roll. We couldn't believe it but it was the author of Petropolis, Anya Ulinich! We wrote back almost immediately going on and on about how we liked the book and included the plan to post it on the blog. Anya replied and included a note on how she bought the vodka for her book party at STD on Church Ave! Now that's a true local! 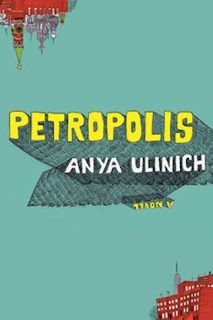 In case all this doesn't give you enough incentive to read "Petropolis" Anya was just honored by the National Book Awards in 2007 as 5 Under 35. The 5 Under 35 highlights the work of the next generation of fiction writers by asking five previous National Book Awards fiction Winners and Finalists to select one fiction writer under the age of 35 whose work they find particularly promising and exciting. So there you have it our very own Jonathan Safran Foer or Paul Auster right here in Kensington... wonder if NY Mag will post Anya's home address on its website like they did to Foer a few weeks ago!? We sure hope not!